Though Arabidopsis thaliana (At) is not considered a crop plant, its characteristics as a glycophyte and dicotelydon make it an ideal model plant for genetic proof-of-concept studies. My first gene AtNHX1; is an integral vacuolar membrane Na+/H+ antiporter that sequesters Na+ and Cl- ions in plant vacuoles. In doing so, it increases water uptake and provides osmotic homeostasis in plant leaves. In addition, AtNHX1 transports K+ into the vacuole, benefitting downstream nutrient uptake and salt tolerance. Along with AtNHX1, my second gene AtSOS1, is a member of a gene family that includes 27 putative Na+/H+ antiporters. It is important for Na+ and K+ balance in cells. It directly transports Na ions across the plasma membrane from the cytoplasm to the interstitial space in plant leaves. In doing so, SOS1 decreases the cytotoxicity of excessive Na+ in the cell. Since AtNHX1 and SOS1 work cooperatively to maintain optimal Na+ concentrations in the cytoplasm, simultaneous overexpression of these genes may confer an additive salt tolerance exceeding that conferred by the overexpression of either single gene. In my current study, both genes were designed on the same construct with strong, constitutive 35S promoters and co-overexpressed in Arabidopsis thaliana. 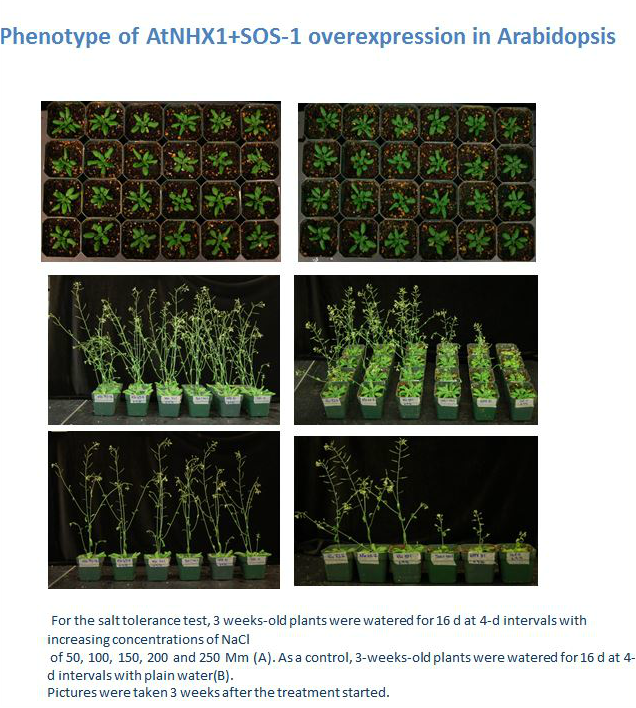 Results prove that AtNHX1 and SOS1 synergistically improve Arabidopsis thaliana salt tolerance with the help of combined effect of these two genes, at salt concentrations of 300 mM NaCl, a concentration nearly always lethal for wild type glycophytes. My goal is to incorporate the use of this genetic engineering strategy in agro-economically important crops to increase global agricultural production through salt tolerance and crop yield.